Mahatma Gandhi in discussion with associates and visitors, c. 1935. Left Thakkar Bapa. Mahatma Gandhi in discussion with associates and visitors, c. 1935.Left Thakkar Bapa. Mahatma Gandhi reading newspaper at Harijan Niwas, Delhi, January 1935. Mahatma Gandhi at Teffin Institute, Bombay, May 22, 1935. Mahatma Gandhi with his associates at Borsad plague relief camp, May 25, 1935. Mahatma Gandhi with associates at Borsad plague relief camp, May 25, 1935. Mahatma Gandhi leaving the railway train in an intermediate station on way to Ahmedabad, May 25, 1935. 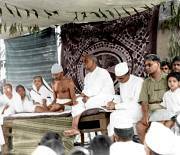 Mahatma Gandhi addressing a meeting of the villagers at Vera village in the plague effected area, May 1935.